Position your property in the market to attract and retain new residents with key strategies for reaching qualified prospects, selling your property’s benefits, and successfully closing the deal. Get the most bang for your buck. Complete this course to learn how to position your rental property to succeed in your market. 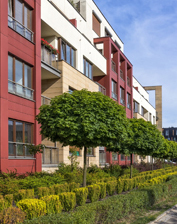 Discover what’s unique about marketing multifamily properties, learn what it takes maximize the value of the property, meet owner’s goals, and more effectively attract and retain tenants. Register today and start dominating the marketplace. See the Big Picture. Understand the impact of business cycles on supply and demand, and how economics play a role in marketing and leasing. Position Your Property. Want to hit your target audience? Develop a marketing mindset and learn to incorporate advertising, public relations, social media, and analytics. Take this course on its own or together with Leading a Winning Property Management Team (HRS402) with the Managing People & Marketing/Multifamily Track. A standard calculator or smartphone calculator is recommended; Laptop optional. Online: The online course takes approximately 4-6 hours to complete, followed by the online course exam.